Could someone please post a puzzle of a part of Prevotella Albensis? 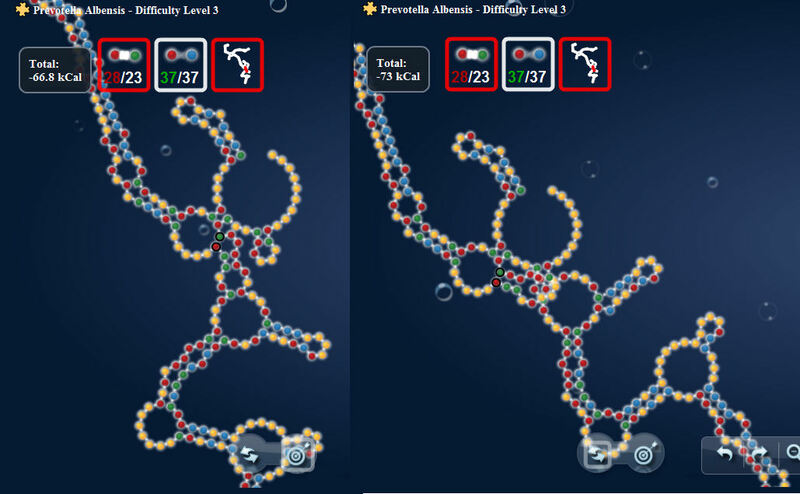 If we could get that partial puzzle stable (especially the pair in red) then we could use it as a starting point for the complete Prevotella. Yep, I'm stuck here too. The dev team is reviewing this puzzle. We will let you know the outcome. Well, no matter what I do I end up breaking basepairs at the marked places. I have tried loop energy optimisation and whatnot. Is it possible to solve this one? Have the devs managed to fold this one correctly - ever? I'm sure it must be som loop optimisation that eventually will make it solvable, if it can be solved. I forgot to show the state where the basepair you wanted to fuse are sticking together. I have put the pattern mode to the left and the natural mode to the right in the image below. None of the highest ranking players have managed to fold this one yet. Could the developer team please comment on this? Are you sure that Prevotella albensis can be folded into target mode? Are you sure the target mode setup is correct? Maybe the folding algorithm has flaws that makes the energy configuration in the problem area wrong? 1. Are you sure that Prevotella albensis can be folded into target mode? 2. Are you sure the target mode setup is correct? 3. Could the folding algorithm contain flaws that makes the energy configuration in the problem area wrong? I realized level 3 of Symbiotic plasmid is 1 nucleotid longer (the first one) than the other levels. Maybe something similar happened to Prevotella? I have asked whether the devs have tested that it is possible to fold P.Albensis but they ignore the question. 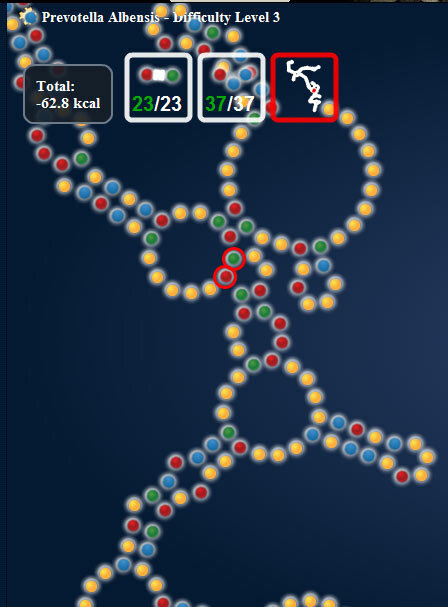 Recently the problem section of that RNA was released as a separate puzzle. I will not try this puzzle further unless the devs confirm that it is solvable after having folded it correctly themselves, or some of you fellow puzzle-solvers manage to solve any of the P.Albensis puzzles. Why bother? I tried the partial, no better than the whole, still doesn't solve, and I see nobody else has solved it either after a day or so. You'd think at least one person would have stumbled upon the solution by now if there was one, wouldn't you? 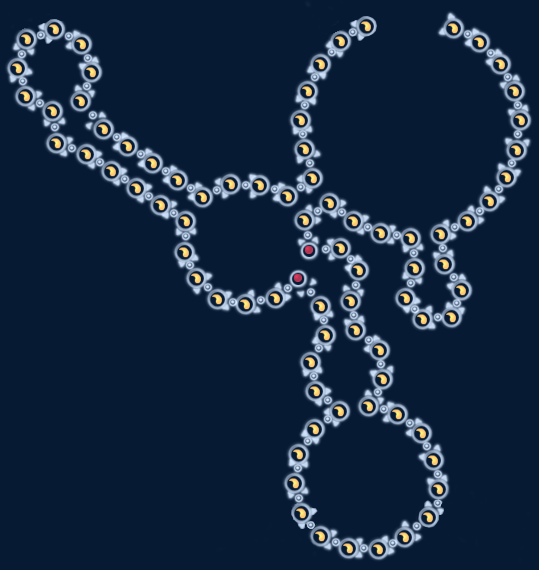 I am fairly new here, and when I mentioned I was attempting this one, I was advised by some of the top players that this one was impossible and to only give it an hour of thought before moving on. This is a simplified version of the Prevotella Albensis Experiment 1 puzzle. It uses the same basic 'apparently unsolvable' shape as the other Prevotella Albensis puzzles. If you simplify it to the problem area, the loop (starting at 7)'s size makes the pairs at (5,21),(6,20), and (14,19) mutually unstable. 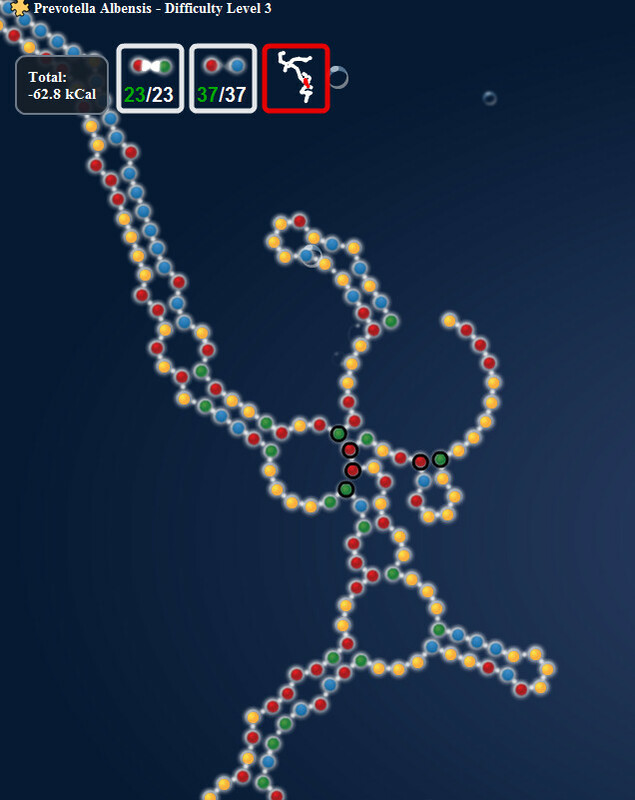 I didn't explore too much so a few other factors could make those pairs unstable as well, but the shape was able to be stabilized with a 5 nucleotide loop.